Promotional one night free with weekly booking. Our home away from home is a soul rejuvenating jewel. A little further down the beach to the right is Breezez. Sunday brunches, an amazing happy hour, and wonderful food. Right next door is Golden Rail Restaurant/Bar...warm friendly atmosphere, great food and very convienent! St. Croix has the uniqueness of having a tropical rainforest on the west and a desert feel on the east side of the island. St. Croix is known for their sugar mills, there are tours available daily. If you like to play the odds, you can try your luck at Divi Casino. 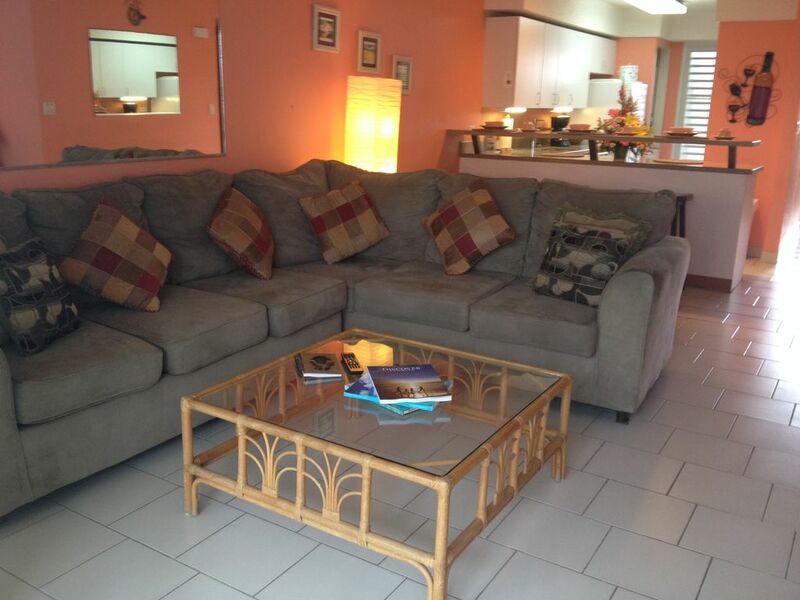 Our beach front condo is located in the center of the island and convenient to everything. We are 3/10 of a mile from the local grocery store and just minutes to downtown Christiansted. There you will find unique shops and open air bar/restaurants along the lively waterfront boardwalk. Also, you will find all the water fun excursions you would want including sailing, fishing, scuba, snorkeling and boating, which leave several times during the day. If a little island hopping is on your agenda, Sea Borne Seaplane is right there as well with many daily departures to St. Thomas, only a 20 minute flight away! We hope you will enjoy a rejuvenating stay at our vacation condo. Come and find yourself again....in the simple life of St. Croix! I am a Minnesotan. Born and raised. I have always had a love for the Caribbean. The beautiful colors of the water. The friendly folks that live in Paradise. I have been lucky enough to acquire my little piece of paradise that I truly enjoy sharing with friends, family and others. I looked at a lot of properties before deciding on Colony Cove. Colony Cove is centrally located, close to Christiansted, which has the boardwalk and shopping and restaurants. We have beautiful gardens and views of the ocean and east end of the island. We also have the best staff who are so thoughtful, nice and a whole lot of fun! master bedroom has shower bathroom within the bedroom. The 2nd bathroom has a shower/tub. Christiansted is just 3 miles east of our condo complex. Great Restaurants/Bars and excellent shopping. Big Beards snorkeling excursions are there and Scuba for diving. The condo complex is on the beach. My condo has a beautiful view over the gardens, pool and onto the ocean. Everyone enjoys dining out on the gallery and enjoying the views! The center of the complex is grassy and beautiful gardens run throughout and around the pool. Masks, fins and snorkels. Along with beach towels. Quiet, peaceful and relaxing. Just what I was looking for. Satisfactory accommodation with the washer/ dryer a big plus. Pool and views a nice touch. I am glad you found the peacefulness you were looking for! It was a pleasure meeting you and your daughter. Keep me in mind for future vacation relaxations! First time to St.Croix and we had no idea about locations to stay. This was perfect! Close enough to everything. Very nice condo and plan on being back! So glad you had a wonderful time! We look forward to you coming back! Very nice and clean condo with great views to the beach, less than 10 min drive to everything Christiansted has to offer. Exactly what we needed for our first time visit to St. Croix. We had a great stay! I am so glad you had a wonderful first visit to St. Croix! Do keep me in mind for future relaxing vacations! The home is exactly as pictured, and fully stocked minus beach towels. Everyone we interacted with was incredibly kind and helpful. The balcony was amazingly comfortable and picturesque. Lizzie was responsive and helpful at all times. The reason for 4 stars and not 5 is perhaps due to my own expectations after reading the description. I imagined we could walk to the beach and see/visit restaurants on each side, that we could laze about the beach all day, and that the grocery store was an easy stroll away. In reality there was a restaurant on either side of us but we only saw the signs of it from the street and could never see it from the beach so we never knew where to go. There was a beach right in front of the property but it’s covered with large rocks and nearly inaccessible. If you stroll down further to enter from one of the other beaches you are in front of another properties beach so you don’t feel confident to leave your things. Additionally, in many places there were black sticks in the water so it wasn’t ideal for entry. The beach there is beautiful to look at, but is not ideal for swimming. Lastly, the grocery store it’s not far away but it is a challenging walk in that there are not sidewalks for most of it, and there are no streetlights so you feel unsafe taking that journey if you don’t have a car. I’m glad you had a great stay Joanne. Feel free to come back anytime for a little rejuvenation! Thank you so much for your kind words!! I am so glad you enjoyed your stay!! The view from the gallery is so very nice and relaxing. I hope you come back for another relaxing vacation!